Sou | 11:54 PM Feel free to comment! There was a new paper out in Science last week about past changes in ocean circulation. It's from a team led by L. Gene Henry, a graduate student at Columbia University’s Lamont-Doherty Earth Observatory. What they were exploring was the past relationship between climate and ocean circulation in the North Atlantic, several thousand years ago. The paper focused on changes in the Atlantic meridional overturning circulation (AMOC). Here we investigate the relationship between Northern Hemispheric climate as recorded in Greenland ice cores and marine sediments, along with isotopic deep-sea paleoproxies sensitive to changes in North Atlantic Deep Water (NADW) production and AMOC transport during marine isotope stage three (MIS3). Throughout that time, when climate was neither as warm as today nor as cold as the last glacial maximum (LGM), ice sheets of intermediate size blanketed much of the northern hemisphere, and large millennial stadial - interstadial climate swings (6, 8) provide a wide dynamic range that allows examination of the ocean’s role in abrupt change.. 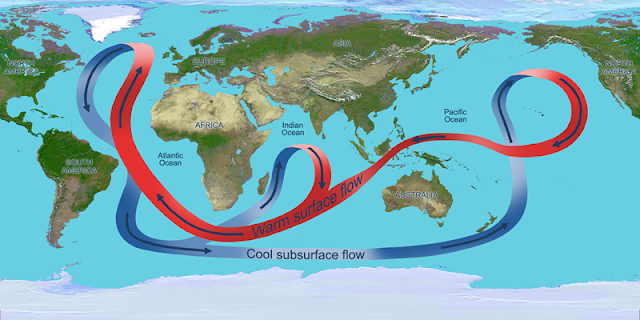 The Atlantic meridional overturning circulation (AMOC) brings warm, salty surface water up from the tropics. Salty water is more dense than fresher water, and the water sinks in the north Atlantic. In the deep ocean, the water flows south. You can see it in the top left of the diagram below. The red flow is in the upper ocean and the blue flow is in the deeper ocean. Because this region of the deep North Atlantic is characterized by steep lateral gradients in tracers of NADW [North Atlantic Deep Water] and Antarctic Bottom Water (AABW), the Bermuda Rise has been intensively used to explore the connection between changes in ocean circulation and climate. The chemical tracers show that the speed of the ocean overturning circulation changed first, and that sea surface temperature changed a while later. That suggests that cooling may start with changes in the ocean circulation, influencing the northern sea surface and atmosphere, said co-author Jerry McManus, a professor at Lamont-Doherty Earth Observatory. Evidence from ice cores and deep-sea sediment has shown that the northern climate also cooled before the southern climate during these abrupt changes, creating a “bipolar seesaw,” with the north cool while the south was warm, and the south cooling as the north warmed. The scientists stress that more work is needed to determine whether changes in ocean circulation initiated the abrupt climate changes or were an intermediary effect initially triggered by something else. “Our study supports the view that changes in ocean circulation were at least in part responsible for causing abrupt climate changes. However, what in turn caused those changes in circulation remains a mystery,” Henry said. Also unclear is why these abrupt climate shifts, also seen in previous ice ages, haven’t happened in the past 10,000 years. The instability appears to occur only in certain temperature ranges, and when there is a large amount of land ice that could contribute freshwater. They seem to be suggesting that it hasn't happened in the past 10,000 years because it hasn't been cold enough, so there hasn't been enough ice. ...The evidence here nevertheless indicates that the greatest AMOC reduction and the coldest stadial intervals accompanied the largest iceberg discharges. This suggests that the iceberg discharges may have provided a positive feedback mechanism to accelerate the initial cooling within each multi millennial climate cycle. In addition, the extended Heinrich-stadial reductions in AMOC observed in this study coincide with intervals of rising atmospheric CO2 (33), while CO2 declined when AMOC increased during the subsequent sharp transitions to northern interstadials, supporting a potential influence on the atmosphere by the deep circulation on millennial timescales. One reason the authors refer to a positive feedback from iceberg discharge is a study they referenced, by Stephen Barker et al from last year (in Nature). They looked over a much longer time span (400,000 years). What they found was that there was "a systematic delay between pronounced surface cooling and the arrival of ice-rafted debris at a site southwest of Iceland over the past four glacial cycles, implying that in general icebergs arrived too late to have triggered cooling." They posited that rather than trigger cooling, "freshwater derived from melting icebergs may provide a positive feedback for enhancing and or prolonging stadial conditions". "Our results show that it continued all the way to Iceland. The warming was slow and gradual, and happened simultaneously in both hemispheres. Little by little the warm Atlantic water penetrated into the Nordic sea underneath the ice cover. It melted the ice from below. Once the ice was gone, the pump started up again, bringing additional warm water into the Nordic seas. And we got a warmer period for 50 years. " says Rasmussen. ..."There are no symmetrical processes in the north and the south -- the climate changes were principally governed by simultaneous warming and the constant closing and re-opening of the sink pump in the Nordic seas" says Tine Rasmussen. The subject is also much studied to see what is happening now. This is in part because changes in the North Atlantic affect large populations, particularly in western Europe. Last year there was the paper by Stefan Rahmstorf and colleagues, which sent deniers at WUWT into a panic. It suggested that the melting of the Greenland ice sheet had slowed AMOC over the twentieth century. Before that, in 2014, there was a paper by Chris Boulton and co, about signals that could be used as an early warning of a collapse of AMOC. Neither of these papers suggested that AMOC was about to shut down. The Boulton paper was about signals that could detect changes 250 years before any collapse. Overall, the subtropical array has measured a decline in the AMOC from an average strength of 20 sverdrups in 2004 to about 15 sverdrups a decade later. (A sverdrup is a unit of flux of 1 million cubic meters of water per second—roughly the total flow of all the world's rivers into the oceans.) That decline is an order of magnitude more than models suggest could be due to climate change. Scientists suspect some natural cycle is to blame, such as the 60- to 70-year cycle of varying sea temperatures called the Atlantic Multidecadal Oscillation, says Meric Srokosz, an oceanographer at the University of Southampton in the United Kingdom, and the science coordinator for RAPID, the U.K.-funded portion of the 26.5°N array. Initial analysis of the latest unpublished data, from the 18 months through October 2015, shows the AMOC's average strength leveling out at about 15.5 sverdrups, Srokosz says. “It could be a hiatus, or it could start coming back up,” he says. It will take another decade of measurements to separate the climate change effect from natural variability, he says. Are Scientists Preparing for a FlipFlop Back to Global Cooling Predictions? What he failed to understand was that any changes to AMOC would, at best, only affect part of the northern hemisphere. It would be not at all likely to result in a drop in global temperatures, given the amount of CO2 in the air. Naturally most of the climate scientists who make such predictions expect the cooling to occur over a relatively short timescale, before the ice melt forcing which causes the predicted cooling is overwhelmed by our continued sinful emissions of CO2. But a fallback prediction of imminent abrupt cooling does conveniently make it rather difficult to falsify anthropogenic climate theories based on temperature alone, should global temperatures suddenly drop. Would you be surprised if there were conspiracy theories at WUWT? If you've ever been there little would surprise you. prjindigo is patiently waiting for the temperature to drop. He's been waiting for his entire life and it hasn't happened yet. (The last time there was a "coldest" year on record was 1909.) I don't think the penny will drop ever, despite the temperature not. Now I’m wanting to have stored up a whole bunch of popcorn like the preppers were six years ago… just so I have a munchy while I watch this freak weather show. The reason the Earth STAYS in a specific temperature range is because any time it leaves it violently reacts to go back. Homeostasis isn’t just a definition on a science test! Jim Watson mutters something completely irrelevant to the subject. He might be thinking of S. Fred Singer's predictions. Predict all possible outcomes and when one of them happens–voila!–you’ll look like a genius! Warmist will blow hot or cold in the mildest breeze any which way for a free paid for climate conference (As long as it’s not in Detroit) and another further study grant. Tom Halla has difficulty grasping the finer points of warmer Earth → Greenland ice melts → more fresh water in the North Atlantic → slowing the AMOC → less warm water from the tropics → colder weather in western Europe. So cooling will actually be due to global warming? Nice thing if you can get away with it. ...in 2009 to 2010, the average strength of the AMOC plunged by about 30%. Heat remained in the tropics rather than being delivered to northern latitudes. The consequences included an unusually harsh European winter, a strong Atlantic Basin hurricane season, and—because a strong AMOC keeps water away from land—an extreme sea level rise of nearly 13 centimeters along the North American coast north of New York City. When are people going to catch on to this ongoing charade? Or have they already? This statement is not true–hundreds of radiocarbon and beryllium isotope dates of glacial deposits in both hemispheres now show that glacial conditions were synchronous in both hemisphere during the last Ice Age. This undercuts the basic premise of this study. Walter Sobchak opts for a Dunning-Kruger comment, thinking that a little knowledge means all knowledge. Someone once told him about the Coriolis effect but he missed the class on thermohaline circulation. Or maybe he can only hold one thought in his head at one time. Rubbish, the currents are driven by the Corriolis. They won’t change much unless Velikovsky was right. Salvatore Del Prete says it's nonsense to think that cooler surface water in the North Atlantic could have any effect on temperature in the northern hemisphere. This is BS. The cooling will be due to weak solar conditions and the associated secondary effects. Think interns of water viscosity. When the Atlantic cools, the Gulf Stream slows and logically Europe and New England cools. When the ocean warms, the system speeds up and delivers more heat to the north. The idiot warmists want to claim that a bit of fresh water from melting ice will stop this flow, such that warming slows the flow and cooling accelerates the flow—the opposite of whet is observed. As the above record indicates, melting ice had nothing to do with the thermostat effect of the AMOC. Javier comments about Eric Worrall's reference to James Hansen's work. At least he understood it, which is more than Eric Worrall and most WUWT-ers can manage. The cooling has to come accompanied of a slowdown of AMOC, and be of regional nature, otherwise it is of not use to Hansen’s hypothesis. Very difficult conditions to meet indeed. A global cooling wouldn’t cut it.